Then, what happens will totally depend on which button(s) the user pushes. Each and every time the user pushes a button, the suitable function will be called and then this menu will appear again. This will carry on until the user presses the button Exit Program. Illustrations will be given here of running the script, with various sequences of button presses. closed the menu window which origins the error message and brought up a new menu. Error - please selects one of the options. The constant e is known as the natural exponential base. It is used broadly in mathematics and engineering. 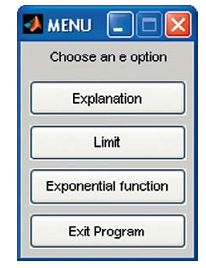 Raising e to the power of x is so general that this is known as the exponential function. The approximation for e is found by using a limit. The approximation for the exponential function can be found by using a series.